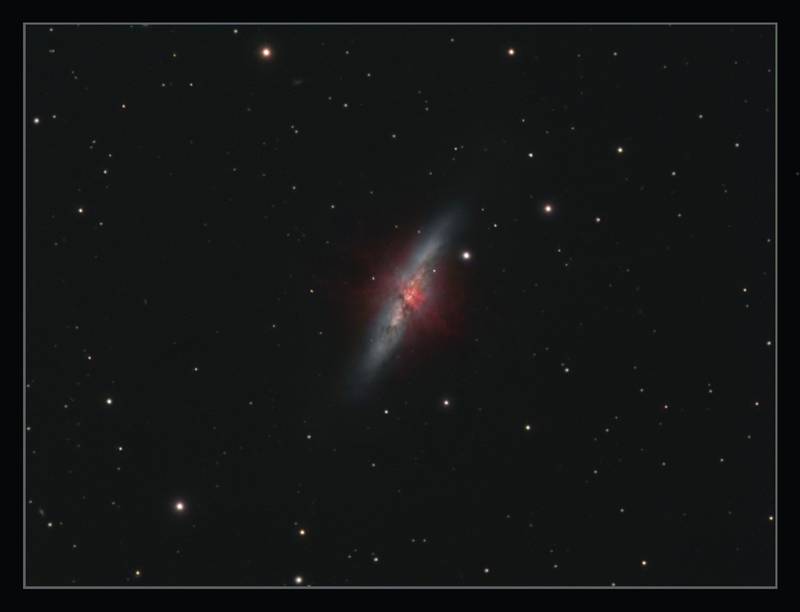 M82, the Cigar Galaxy, really needs no introduction to anyone with aintgerest in astronomy. Discovered, together with M81, on New Years Eve 1774 by Johann Elert Bode, M82 is 12 million light years away in the constellation of Ursa Major, and is an easy target for even small amateur telescopes, with a fair bit of structure visible to the eye. I have seen structure in this galaxy with a 4 inch achromat, and in a larger instrument, a lot of detail can be made out. Distorted by gravitational tidal forces from a close encounter with the larger M81, there are regions of intense star forming activity going on here, 10 times as energetic as in our own galaxy. The spouts of gas heading out of the galaxy at high velocity are powered by supernova explosions that occur as frequently as once every 10 years. M82 is the brightest infra-red object in the sky, and is thought to have very little dark matter surrounding it, as the rotational velocity of its outer regions drops off much more rapidly than is usual in other galaxies. Not a pleasant environment for fragile creatures like us! I imaged this in 2008 with my 14 inch Meade SCT and an Atik 16HRC colour camera, and when I came to stack the recent colour data, added the red, green and blue stacked masters to the stack of recent subs. This had the effect of significantly improving the S/N ratio, and gave great depth to the colour. I added a further 8 hours of Ha data obtained in March 2010 to enhance the starburts activity. Post processing with Photoshop CS2. Data obtained January to March 2010 and February 2008. H-Alpha. TMB 152 16 x 30 minutes binned 2x2 & 22 x 10 minutes binned 1x1. RGB (LX200 & Atik 16HRC) 45 x 6 minutes. Total imaging time. 24 hours 30 minutes.